Relationships can be wonderful buffers against stress, but relationship conflicts can cause considerable emotional pain and stress. Knowing how to apologize--and when--can repair damage in a relationship, but if you don't know how to apologize sincerely, you can actually make things worse! Effective apologies are simple if you know what to say. Here are some easy steps to help you learn how to apologize sincerely and effectively. Knowing when to apologize is as important as knowing how to apologize. Generally speaking, if you suspect that something you did -- on purpose or by accident -- caused someone else hard feelings, it's a good idea to apologize and clear the air. If what you did would have bothered you if it was done to you, an apology is clearly in order. If you're not sure, an apology offers you the chance to "own" mistakes you made, but re-establish what you think was okay. If you feel the other person is being unreasonable, a discussion may be in order. You can decide where you stand on the apology after that. Taking responsibility means acknowledging mistakes you made that hurt the other person, and it's one of the most important -- and neglected -- ingredients of most apologies, especially those in the media. Saying something vague like, “I’m sorry if you were offended by something I said,” implies that the hurt feelings were a random reaction on the part of the other person. Saying, “When I said [the hurtful thing], I wasn’t thinking. I realize I hurt your feelings, and I’m sorry,” acknowledges that you know what it was you said that hurt the other person, and you take responsibility for it. When seeking to understand how to apologize effectively, it’s also important to understand the value of expressing regret. Taking responsibility is important, but it’s also helpful for the other person to know that you feel bad about hurting them, and wish you hadn’t. That’s it. They already feel bad, and they’d like to know that you feel bad about them feeling bad. “I wish I had been more thoughtful.” “I wish I’d thought of your feelings as well.” “I wish I could take it back.” These are all expressions of regret that add to the sincerity of your apology, and let the other person know you care. One of the most important parts of an apology -- one of the best reasons to apologize -- is to reaffirm boundaries. Healthy boundaries are important in any relationship. When you come into conflict with someone, usually there is a boundary that is crossed -- a social rule is violated or trust is broken -- and it helps to affirm what kind of future behavior is preferred. Discussing what type of rules you both will adhere to in the future will rebuild trust, boundaries, and positive feelings, and provides a natural segue out of the conflict, and into a happier future in the relationship. Remember that when you apologize, you're taking responsibility for your part of the conflict. That doesn't mean that you're admitting that the entire conflict was your fault. People are often afraid to apologize first because they think whoever apologizes first is "more wrong" or the "loser" of the conflict. Actually, giving an apology even when only a small part of the conflict was your responsibility is okay, and often healthy. It allows you to establish what you regret of your own actions but confirm your own boundaries as well. When you apologize for just what you did, you can more easily move forward and put the conflict behind you, regardless of the other person's actions. When we apologize, we're able to more easily maintain integrity and forgive ourselves. The other person may be moved to apologize for their actions as well -- it's always nice if they do! -- but this doesn't always happen. Trying to evoke an apology from the other person is a manipulative tactic that sometimes backfires. Apologize for your own peace of mind, and the other person may be inspired to do the same. But it's okay if they aren't. 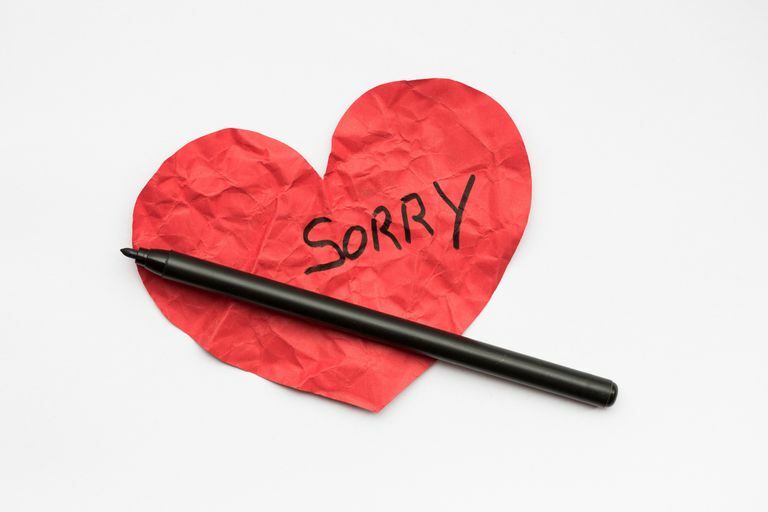 Although apologizing can be a way to maintain integrity and move on from actions we're not proud of, most of us also want to repair the relationship and be forgiven. Sometimes this doesn't happen. If the apology was sincere and included the necessary ingredients, your chances of forgiveness are greater, but sometimes the other person just isn't ready or able to forgive and move on. Or they may forgive you, but still, be guarded. Or they may not realize their own role in the conflict. Realize that you can't control their response, and if you've done everything you can, let it go for now.